It has been hot. The heat appeared earlier than usual at summer’s doorstep and is lingering through its regularly scheduled time. Fire has ravaged our foothills. And rain seldom makes an appearance. This poem is a cento. Piecing poems together from other poet’s words creates a mosaic, a found poem. 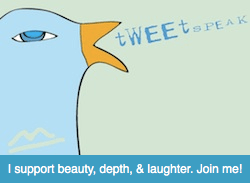 At Tweetspeak Poetry the theme this month is July Mosaic. My poem is found and patched together from the words of Monday’s Every Day Poem, Girl with 13 Necklaces by Tania Runyan. The heat might be getting to me. This entry was posted in Every Day Poems, Tweetspeak Poetry and tagged July Mosaic, Tania Runyan. Bookmark the permalink. Lex, I do like this a lot. Thank you so very much, L.L. I am so glad to have found you. Your work and everyone at Tweetspeak has made a tremendous difference in my writing life. Thank you. I’m still learning from you, while I’m trying to achieve my goals. I certainly liked reading all that is written on your website.Keep the aarticles coming. I liked it!